It is time for you to visit Château de Minière. Château de Minière is located in the heart of the Loire Valley along the scenic and glorious route that connects the castles of the valley. The Loire is an erratic and fertile river. Since 2002, the river has been rightfully placed on the prestigious Unesco World Heritage List. This region in the Burgundian French region of Centre-Val de Loire is best to visit at a slow pace. You don’t want to miss any details of the colorful landscapes or the mysterious castles as you explore by foot or bike. Add to this the indispensable glass of wine, that only adds strength to your experience, and you will have the perfect combination to explore the Burgundian French region. You will experience what the mild climate with a grape does. We have put together some nice locations in the neighborhood along the well-known cycling route ‘Loire à Vélo’. Of course you can also follow this route by car. We also invite you for a cozy picnic under our 200 year old trees on our domain. You can stay overnight in the nearby hotels or B&B’s. Contact us and we will show you the way. This vibrant city is a must see from the area. The skyline that the Château Saumur proudly guards, is sometimes compared to that of Bratislava, the capital of Slovakia. This city built from tufa (local porous bed-rock) is also known for its national horseback riding school: l’Ecole Nationale d’Equitation, where classic French riding is honored. This beautiful abbey is the largest in Europe and an experience on itself. It was the last resting place of Eleonora of Aquitaine, the most powerful woman in Europe during the High Middle Ages, and her second husband, Henry II of England. It is an architectural wonder where you are immersed in art and culture, sustainable development, digital technology and hospitality. You can enjoy performances and exhibitions throughout the year. Moreover, you can dine and even stay overnight. It is nice to stay with Mieke from the Netherlands who runs La Croix Blanche, a B&B in front of the abbey. Chinon, the picturesque village on the Vienne river, requires a stopover. Here Joan of Arc met the Dauphin to persuade him to drive out the English and become king of France. Moreover, the unique medieval castle that overlooks the village was the favorite residence of Henry II of England. It was also the place where he died. The castle received the national ‘Qualité Tourisme’ label in 2013. About 10 km past Chinon you will find the castle of Riveau. Jeanne d’Arc came here to pick up her horses at the end of the 100-year war. At that time, the horses of Le Riveau were in high demand. The fairytale castle is surrounded by 14 gardens, of which the rose garden contains more than 450 varieties of roses. A unique setting where children dream of dragons and princes. You might have thought that the Loire region is not child friendly? Think again. The Château d’Ussé is completely dedicated to the fairytale ‘Sleeping Beauty’. The French fairytale writer Charles Perrault was inspired 300 years ago by this backdrop to create a story of a woman sleeping in a room in this castle for 100 years. An ideal place for small and big girls to relive the fairytale and, who knows, meet their prince. . The castle is located about 15 km from our domain. In 1491 King Charles VIII and Duchess Anne Van Bretagne were married at this location. The politically arranged marriage had to strengthen and maintain the relationship between France and England. The castle has a richly and magnificently decorated interior. Most castles in the area have beautiful gardens and parks, but you should definitely discover the castle of Langeais from the inside. The big treehouse for children in the park is also quite unique. The castle of Gizeux is less known, but impressive because of its 250m long façades. In the summer there are often very nice activities for children. The castle of Azay-le-Rideau is a classic in the Loire region. It is located near the eponymous village on the river Indre, a tributary of the Loire. The castle is enclosed by an artificial canal. The romantic French writer Honoré de Balzac described this gem as ‘a faceted diamond set by the Indre’. On warm summer evenings you can enjoy a beautiful sound and light spectacle. Finally, the castle of Villandry is very worthwhile to visit for its 25 ha walled forest and gardens. 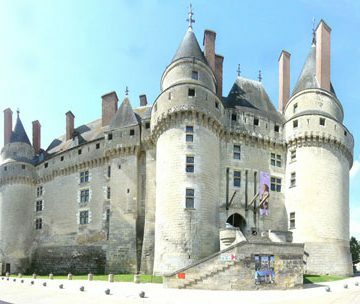 This Renaissance castle is located on the Cher River just before it flows into the Loire. It was inhabited by the Minister of Finance, Jean le Breton (under Francois I, 14th century), who at that time already had a love for the art of gardening. The gardens often changed view over the years. But since the 20th century, they were once again designed as 16th century gardens. Today, ten gardeners work every day on the beautiful shapes and patterns to make them outstanding. A nice fact is that there are also 90 species of birds to spot on the domain.